August 12, 2011 - Like this? Subscribe to get instant updates.
. SharePrintEmail SharePrintEmail.�The killing has started and the first victims are four day old puppies,� read the alert from concerned locals this morning. Is this supposed to be animal control? 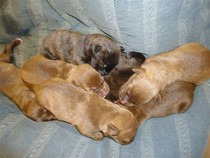 The puppies were saved, but the lactating mom was reportedly shot and killed in cold blood. A foster home is being urgently sought for the orphaned puppies. Please contact chacota@earthlink.net for details. Let the outrage over the senseless and cruel killing of innocent dogs and puppies be known! Dr. John Lauby who is �responsible for this event� may be contacted at ccac@co.cumberland.nc.us or call 910-321-6852. Thanks Simone. This just outrageous. I have sent en e-mmail to the ccoc with a cc to the mayor, mayor pro tem, and the city manager asking for an answer to my questions. Will let you know if I get one. Copy/pasted info to revise into email. Sending separately. Thank you for posting. The good ole' USA. And thank you Lynn. Horrors like this are happening all over the world, but I never thought I'd see this level of ignorance here at home. How can we criticize Serbia and other places if we do the same thing here. Killing is not the answer. This needs to stop NOW! Thank you for letting us know. I have sent my email and am hoping that we are a rapid push to putting an end to the killing of our beautiful animals. Stories like this are so cruel, evil, sadistic and should never happen. Why did this person just shoot this poor dog? Do they not own catch poles and is this like the WILD WILD WEST WHERE THEY SHOT FIRST AND THEN ASK QUESTIONS??? He had no right or cause to kill this dog just because he could. This could have been someones pet that escaped. Maybe the governor should be advised how crazy some shelters are and that they hire gunmen to shoot innocent animals who could be next, a human who they don't like the way they look???? Get real and have humane procedures and then fire your gunmen.Please try to make the world a better place for these poor animals that have already had a rough life and that means don't SHOOT THEM. "In our area the County is responsible for Animal Control Services and Public Health, not any of the 9 municipalities in the County. This was nothing more than a need to kill. Thank you for your concerns. We have been euthanizing about 1000 dogs a month for 30 years. In the year I have been Director I have decreased this number to about 800. With this number we still have a crisis with pack dogs in our city. I am applying for a grant to get spay neuter money to help with the problem in our county. We are working on Citizen education and Spay Neuter programs but we have had 13 cases of rabies in wildlife in our county this year and these pack dogs have been exposed rabies and thus are an imminent and present danger to our citizens and I have been directed to remove them to protect our citizens. We did not kill the momma dog �on the way to nursing the puppies.� The pack was moving through this area and the momma dog had not fed these pups for over 24 hours. These pups were under an abandoned house, dehydrated and in need of feeding and had we not heard them crying they would have died during the night. Our people tube fed these pups last night all night to keep them alive. We have had 15 pets, dogs and cats killed in their own yards by these pack dogs since the first of January 2011. The pack dogs have also killed raccoons and foxes that we tested for rabies and had to be treated as positive for rabies. Therefore the Health Director, Buck Wilson directed me to remove these pack dogs by extraordinary means to protect the citizens of our county as these dogs are going into people�s fenced yards and killing their pets and thus exposing our citizens to rabies. We are trying to be pro active in preventing a child or older adult from being attacked or killed by removing the pack dogs. We have hired a Wildlife specialist to attempt to trap pack dogs. Our first effort is to try to trap them but when that fails we have to remove the dangers to the public. It is an awful distasteful thing my people have to do but we are required to put the safety of the public first. I have spent all adult life protecting animals and relieving pain and suffering in animals as a practicing Veterinarian for 30 years but my responsibilities in this job require me to protect our citizens. Concerning those dogs we trap and bring into our shelter I would be happy to talk to any agency willing to assist in rehabilitating and returning to a functional life. I have requested help from the NC-HSUS and they are not able to assist at this time. The local PAWS and SPCA are full and unable to take any of these animals as projects to rehabilitate. I am open to any and all ideas or organizations that would like to volunteer to help the pack dogs we bring into our shelter. We have adopted two of the pack dogs that we captured to loving homes. We have fostered 10 pups from these pack dogs to loving homes that will give them a chance to survive and live a normal life. Again, Thank you for your concerns. Terrible. And they say that the US is supposed to be a civilized society.